Bird feeders are a fantastic addition to any garden. They offer a great way for bird watchers to catch a glimpse of the various species of birds populating the area, literally bringing the garden to life as various birds snack on the food provided. Even those that don’t care too much for bird watching can appreciate a good bird feeder. Birds are great for controlling annoying garden pests, while the sound they make when chirping away is natures very own alarm clock. However, bird feeders pose one notable issue - they don’t just attract birds. Squirrels are perhaps the biggest culprit when it comes to stealing bird food from garden feeders. While certainly nice to look at, squirrels are quite the pest, eating as much food as they can get from the feeder, rarely leaving anything behind for the poor birds. In fact, some squirrels get rather destructive when it comes to food, so they may end up damaging your feeder. Even worse, the amount of food they eat means you need to buy bird feed much more frequently than you would just feeding birds, so squirrels can certainly be a nuisance when it comes to bird feeders. So, investing in a squirrel proof bird feeder is a great idea if you’re having problems with hungry squirrels stealing all your bird feed. There’s many designs available however, so finding a suitable option requires a bit of research. These feeders are used to hold suet balls, which are calorie-rich balls of animal fat that birds feed on. Suet is a fantastic bird feed as it provides plenty of calories that birds require due to their high metabolism. The feeders themselves tend to be basic in design, offering ample space for the suet balls to be picked at. As the name suggests, these feeders are used to hold various types of bird seeds. They are quite popular and most people recognise them for their cylindrical shape where the seeds are held. Different shapes are available too, with the main purpose being they hold enough seeds for various birds to feed on. Rather than having an enclosed feeder, fruit feeders have a simple tray design that allows them to be easily accessible. This allows various fruits and nuts to be place onto the surface to attract the birds, but unfortunately, they are also the easiest for squirrels to steal from. ​Size: The bigger the feeder, the bigger the of size birds you can attract. Many people enjoy smaller birds however, in which case large feeders should still have narrow feeding ports. Also consider the amount of food you want to provide, as this will impact how often you need to refill the feeder and buy new feed. Durability: This is especially important when it comes to deterring squirrels, as more robust feeders can withstand their attempts at gaining access. Squirrels are known to damage feeders that aren’t too strong, so always make sure the materials are tough and hard-wearing. ​Weather Resistance: Bird feeders are outside year-round, so avoid cheap materials that cannot withstand rain and heavy winds. Wooden feeders may be prone to rotting over time, while certain metals may rust too, so be mindful of this when choosing a product. The Squirrel Buster Mini Bird Feeder is a simple yet effective anti-squirrel feeder. The four wire perches are designed to specifically prevent squirrels from gaining access to the seeds inside, as they only activate with lighter weights of smaller birds. As the only way for the seed to be dispensed is to sit on these wire perches in front of the feeder port, there is no simple access for any opportunistic squirrels. Should the pest be feeling brave and attempt to chew through the wire mesh, they won’t have any success as the wire is 100% chew proof and doubles up as additional perch spots for any bird waiting their turn. With a 750g capacity, the Squirrel Buster Mini has enough space to hold ample seeds for smaller birds - this saves the hassle of constantly refilling the feeder. Bird seed is even keep fresh thanks to the seed tube ventilation system, which allows fresh air to circulate the feeder while allowing hot, humid air to escape. Best of all, should a cunning squirrel try to break its way inside, the Squirrel Buster Mini Bird Feeder is covered by a two-year warranty! The Squirrel Buster is a larger version than the Squirrel Buster Mini, so it suitable for attracting birds on the larger size. However, it’s design means that unpleasant birds such as pigeons cannot gain access and steal the food intended for smaller birds. Squirrels will also find it impossible to access. This is thanks to the feeder design, which only dispenses food through the wire perches connected to the feeder port. The weight of a squirrel is always immediately recognised, so the feeder won’t dispense any food should they sit on the perch. With a robust design, the squirrels won’t be able to smash their way through, with the chew-proof wires being working well to keep them a bay. Birds can either sit on the wire perches or on the wire mesh, with enough seed being dispensed at the base to feed plenty. It also features the seed tube ventilation system to help keep feed fresh and moisture-free, while the 750g capacity means you only need to refill every few days. Like all Squirrel Buster bird feeders, it comes with two-year warranty against damage from squirrels. The Sunflower Heart Feeder from Roamwild is great squirrel-proof bird feeder that couldn’t be easier to use. Simply fill the bird feeder with your desired seed, hang in the garden and watch the birds feed! Using two spring-loaded feeding ports, squirrels cannot get access to any type of feed, as their weight causing the port to instantly close. The same design also deters pesky large birds such as pigeons, magpies, crows, and jackdaws, and you don’t have to adjust any settings either - it’s good to go straight from the box! With a 1.5L capacity, this is a huge feeder that will hold enough bird feed to last many days. Most squirrel-proof bird feeders tend to be on the smaller side, making this larger design especially useful. Don’t worry about the Sunflower Heart Feeder getting easily damaged either. Fitted with a robust metal structure, squirrels that try their luck breaking into the feeder will come up short-handed any time. These stainless-steel protectors prevent any damage from pecking or chewing, so the feeder will survive anything nature throws at it! The inclusion of a weather protection guard is a great touch, allowing the bird feed to remain dry in the seed port section even during heavy rains, while the UV stabilised plastic tube is also highly resistant. 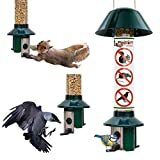 If you’re looking for a unique squirrel-proof bird feeder, then look no further than the Opus Squirrel Be Gone Bird Feeder Country House with Chimney. That’s right, this adorable bird feeder features an adorable country-house design! Of course, the main feature here is the ability to keep out squirrels and other pests, which it does to great effect using a weight activated system on the front perch bar. Completely adjustable, you can set a desired weight for attracting birds of varying sizes while keeping out pests like squirrels, pigeons, rats, and magpies. Filling the bird feeder couldn’t be easier; simply remove the roof and fill as much as 3.6kg of mixed seed feeds like sunflower, hulled sunflower, or safflower seed. That’s a seriously impressive capacity that means regular refills won’t be necessary, even when used frequently. Better still, you have the option of either hanging it like a conventional feeder or attaching it to the top of a post. The structure is made entirely from metal so can be chewed or cracked open, while being rust-free to ensure longevity. Not all squirrel-proof products are actual bird feeders - some just cover them like the Chapelwood Squirrel Blocking Cage! This is a great option for anyone that already has a bird feeder that is attracting unwanted attention from squirrels or larger wild birds. It could be easier to use either! The cage assembles in a matter of seconds, after which it’s just a case of securing it over your bird feeder. Openings in the cage are spacious enough for small birds, while squirrels, pigeons and other nuisance birds are kept a bay. As powder coated stainless steel frame, there’s no way a squirrel can chew its way through, while larger birds won’t have a have chance pecking at the cage. This leaves your bird feeder for all the lovely small birds in your garden to eat in peace, with feeders up to 12-inches in height being compatible with the cage. A fine option if you already have a feeder and want to keep out squirrels or larger birds, the Chaplewood Squirrel Blocking Cage ensures your bird seed is only for the birds that you want - and nothing else!